Strawberry season is in full swing (at least here in Montreal) and I knew I had to highlight this delicious fruit in the best way possible. 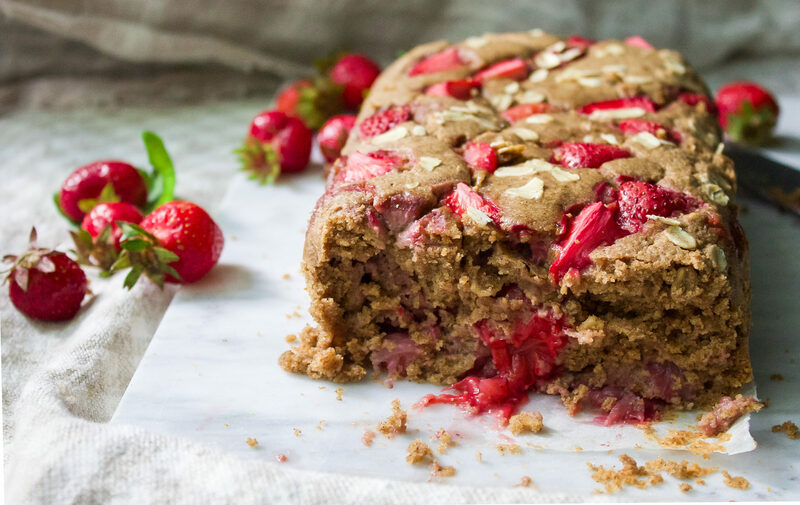 The strawberries are so sweet and flavourful this time of year, I can’t wait to make jams, smoothies and more of this cake! I always give tips and tricks on my Instagram story (you can follow by clicking the icon above!) and this weeks was about buying seasonal fruits and freezing them yourself for smoothies, baked goods etc.. throughout the off season. This is a much cheaper option and you get to support local farms. 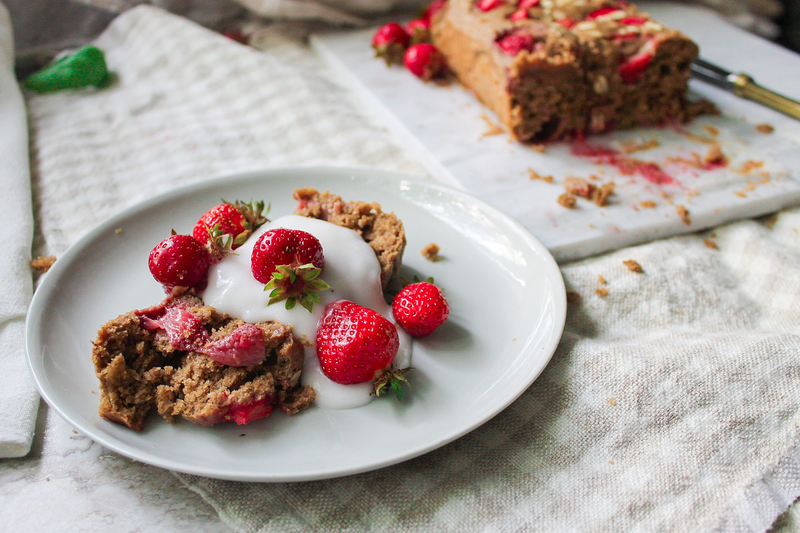 This cake is super moist and crumbly- and perfectly sweet from the strawberries and coconut sugar. The flours are simple oat and almond making it a delicious breakfast option. Serve alone or with whipped coconut or your favourite dairy free yogurt. Hope you love it! 1. Preheat oven to 350 degrees F. Line a loaf pan with parchment paper. 2. 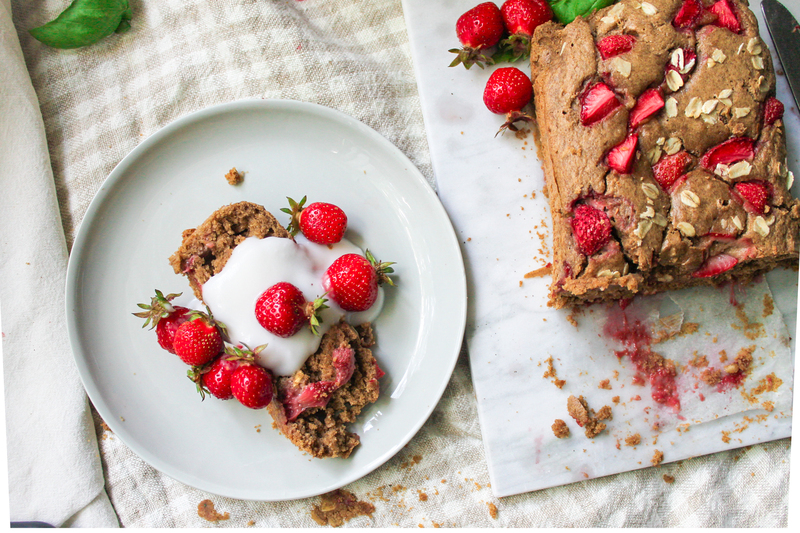 Scatter strawberries evenly in the loaf pan. 3. 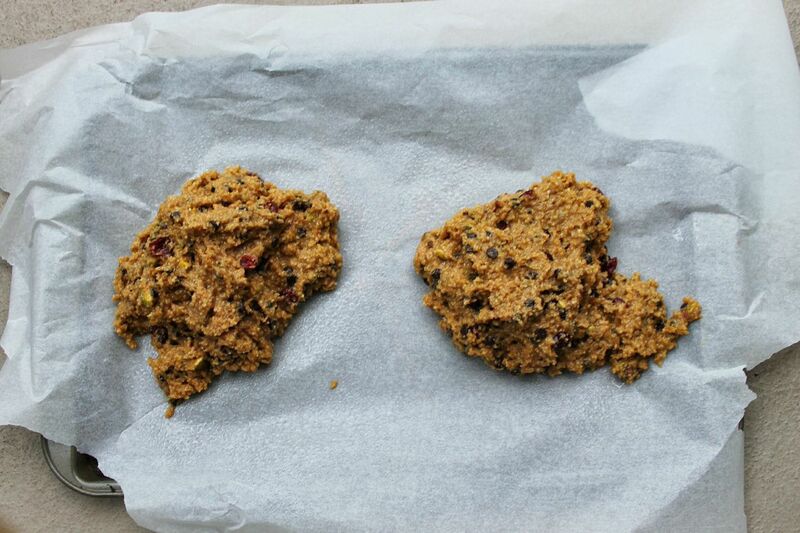 In a large bowl, mix together the oat flour, almond flour, oats, salt, baking powder, coconut sugar and cinnamon. 4. 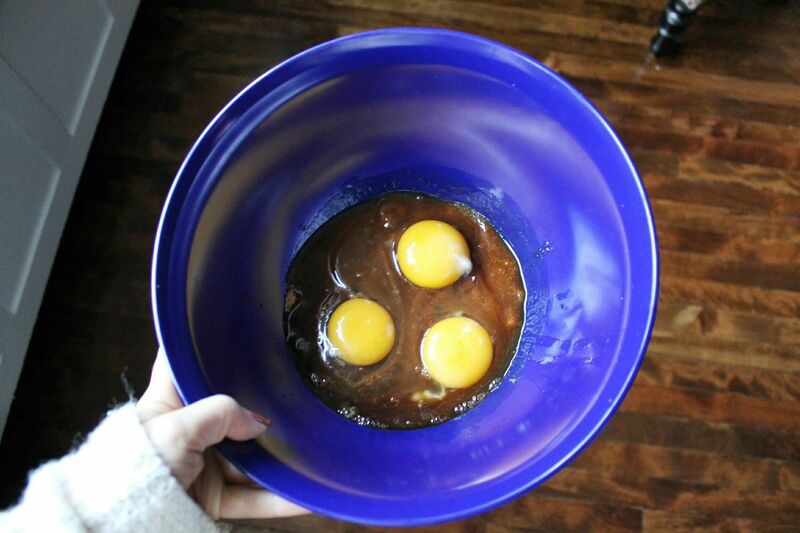 In a separate medium bowl, whisk together the vanilla extract, eggs, almond milk and coconut oil. 5. Add wet ingredients all at once into the dry. Mix until well combined and pour into loaf pan. 6. Bake for 40 minutes or until top is golden. *If you are using a toothpick to check doneness, remember the strawberries will remain wet, so try and find a spot thats strawberry free to check the cake itself! 7. Allow to cool completely before cutting! I like to store mine in the refrigerator. Holidays always remind me of ‘Mandel Bread’ (or is it mandelbrodt?) 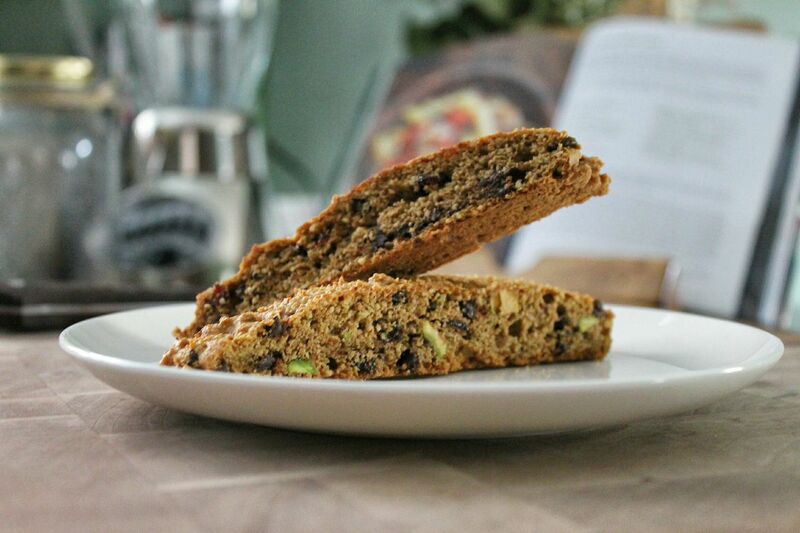 the Jewish version of Italian Biscotti. Biscotti actually means twice baked, which gives it that amazing crunchy texture. 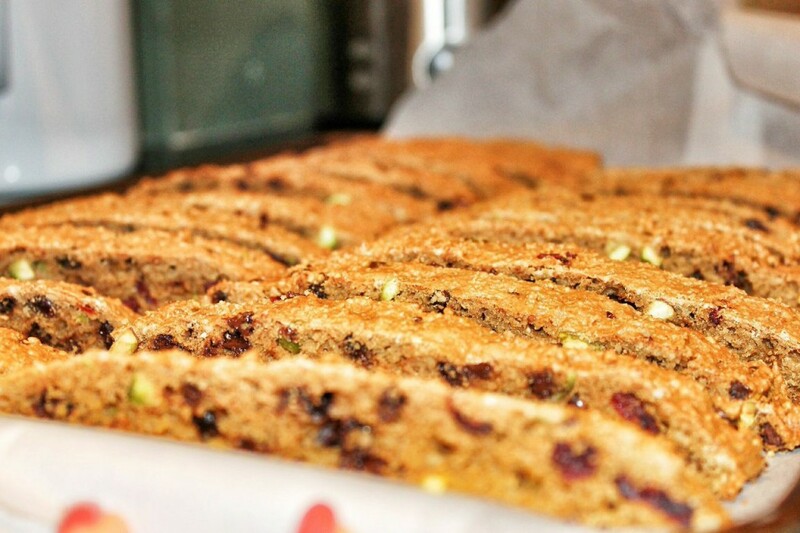 My grandmother makes THE best mandel bread, always packed with lots of chocolate chips, nuts and of course SUGAR!!! I wanted to make a cookie that will not only look amazing on your Thanksgiving or Christmas table, but will also be a nutritious snack to have with your afternoon tea, or morning coffee. I know how hard it can be to make food that meets the dietary needs of all your guests, especially when it comes to desserts. 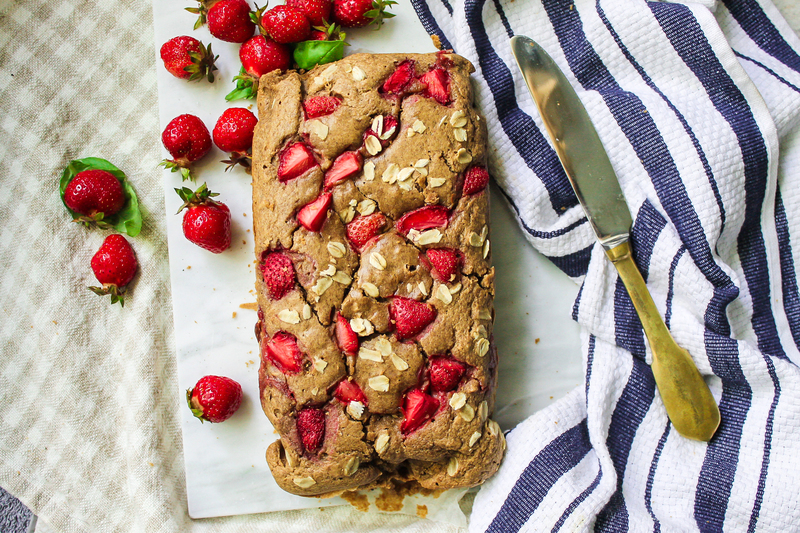 If you only have one guest who stays away from gluten and another that can’t eat dairy it can be a nuisance and an expense to provide cakes or pies just for them! You also won’t come off as the best hostess if you don’t provide them with anything at all! So what to do? Making gluten/dairy free desserts on your own will save you lots of money and maybe get you to even make some dietary changes of your own. These cookies are a treat both allergy sufferers and non allergy sufferers can equally enjoy! 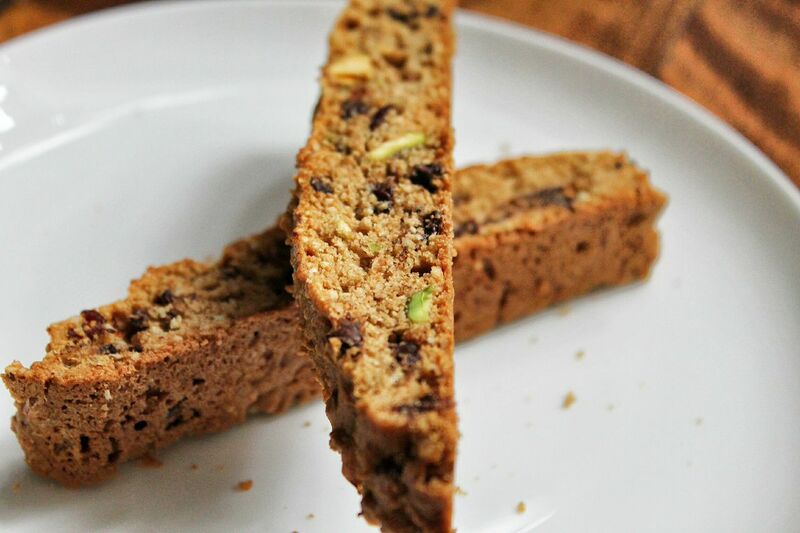 Whats great about these biscotti, is that they aren’t SUPER sweet. At first, I thought I would change the recipe to provide more sweetness, but with the dried cranberry and dark chocolate you don’t really need much more. 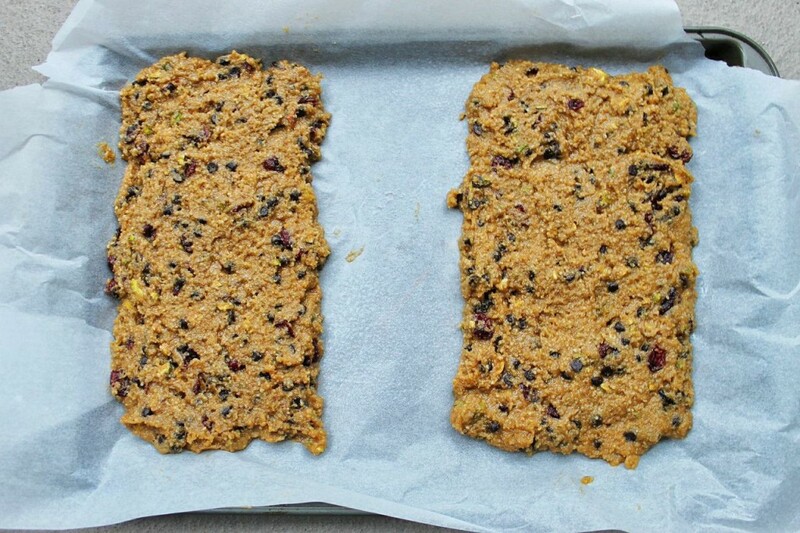 They are packed with slow burning carbohydrates from the oat flour and lots of vitamin e, protein and healthy fats from the almond flour. I also used coconut sugar which is mild in flavour and has a low glycemic index to keep those blood sugar levels stable. You even get some antioxidants from that dark chocolate 😉 Happy Holidays everyone! 1. Preheat oven to 350°. Line a large cookie sheet with parchment paper and grease. 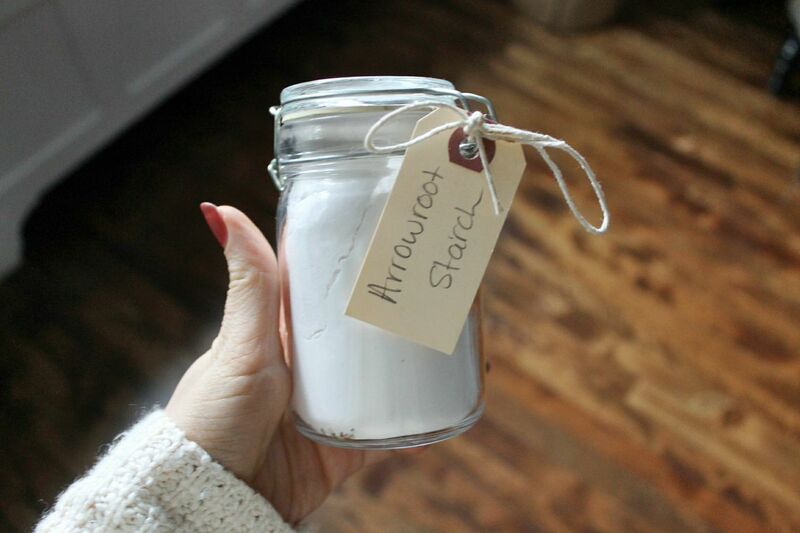 Whisk almond flour, oat flour, arrowroot starch, baking soda, and salt in a bowl; set aside. 2. 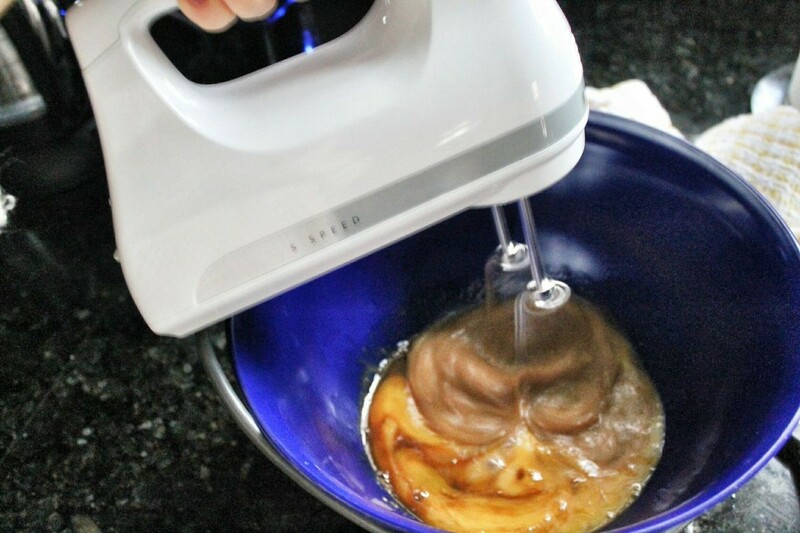 Using an electric mixer, beat coconut sugar and eggs until pale yellow and thick, about 2 to 3 minutes. Mix in melted coconut oil and vanilla. 3. With mixer on low speed, beat in flour mixture until just until blended. 4. 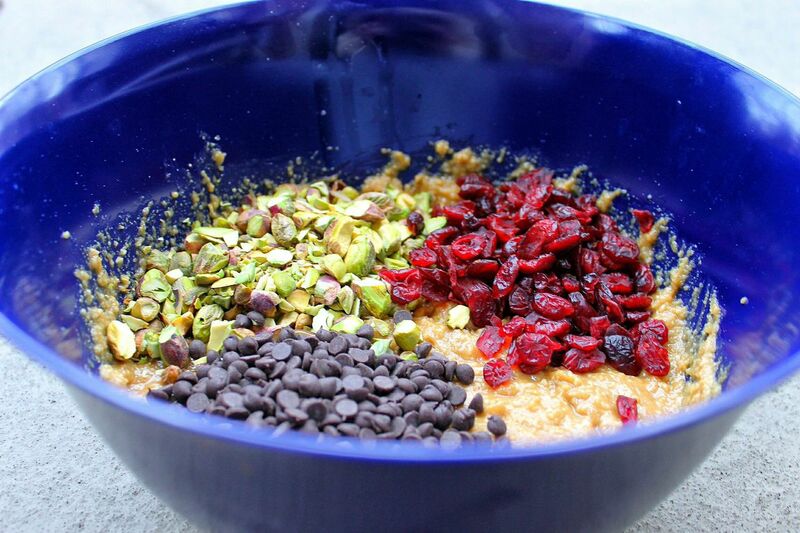 With a spoon or spatula, mix in dark chocolate chips, cranberries and pistachios. 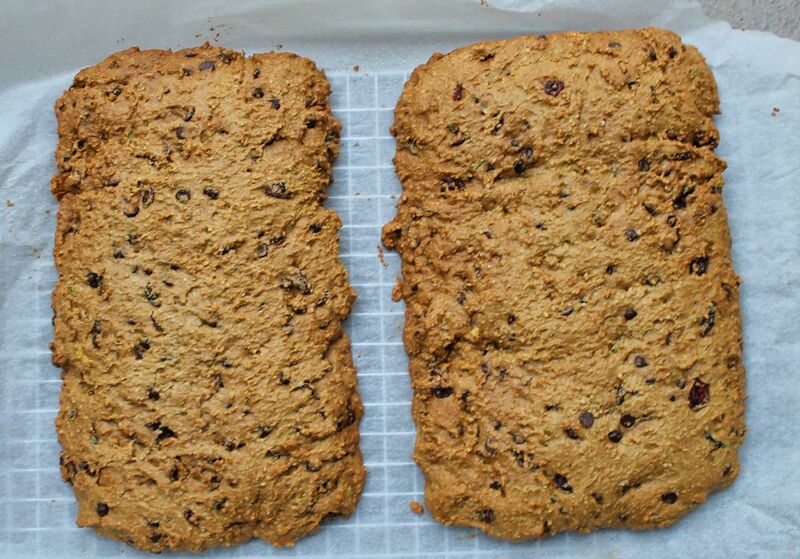 5.Divide dough in half and turn out onto your parchment lined baking sheet. Wet your fingers and shape each portion into a 10”-long log and flatten each into a 1”-wide strip. Bake until lightly browned, about 25 minutes. 6.Transfer to a wire rack and let cool for 10 minutes. While they are cooling, reduce oven heat to 325°. 7. Transfer strips to a cutting board. Using a serrated knife, cut each strip diagonally into 1/2”-thick slices. Place slices, cut sides down, on baking sheet. Bake for 10 minutes. 8. Turn cookies over and bake 10 minutes longer (cookies will be slightly soft in the center but will harden as they cool). 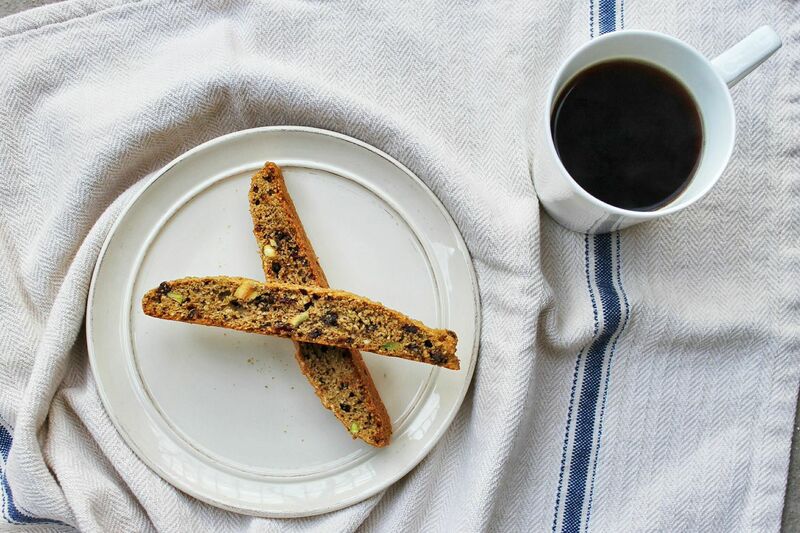 Transfer biscotti to wire racks and let cool.